A baby's first birthday is such a joyous occasion and special milestone for all parents. Many mark the celebration by choosing a theme and then coordinating the colors, decorations, desserts and perhaps even the gifts for the event. 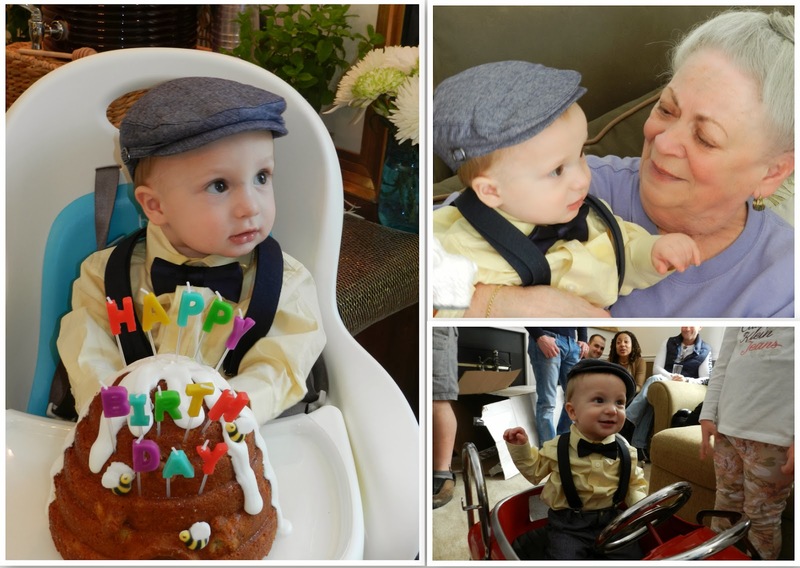 It's all part of the fun of sharing this moment with family and friends, and it's the making of these memories to last a lifetime which makes baby's first birthday extra special. One proud mother recently shared a few photographs of her baby's first birthday with me and after seeing them I just knew all of you would appreciate them too. Luckily for us, she agreed to share them here on Good Things by David, and was even nice enough to provide sources, inspiration and a bit of background. It's the type of birthday party that took a lot of effort, planning and a flair for style to make it look picture perfect. I think you will agree that it was indeed The Bee's Knees. You see, bees & hives were the theme of Sam's first birthday party and his mother, Jessica, decided to decorate, bake and gift for the occasion with a plethora of buzzing sweets that were absolutely stunning. Old-fashioned Ball jars, honeys, flowers, craft paper decorations, garlands and gleaming silverware were just some of the accouterments at this glorious birthday celebration. If you're looking for ideas for your next birthday party, celebration or even for a spring luncheon, take a very close look at what Jessica created & shared. One of Jessica's fondest memories from childhood was of visiting her grandparents in North Carolina during the summer, and going to the farmers' markets where jars filled with honey on the comb could be purchased. I'm told that her great grandfather kept bees on the family farm, so it was only natural for Jessica to honor her past & present family members by having such a festive "Bee-Day" for baby. With Sammy turning one year old it was also his chance to taste honey for the first time! 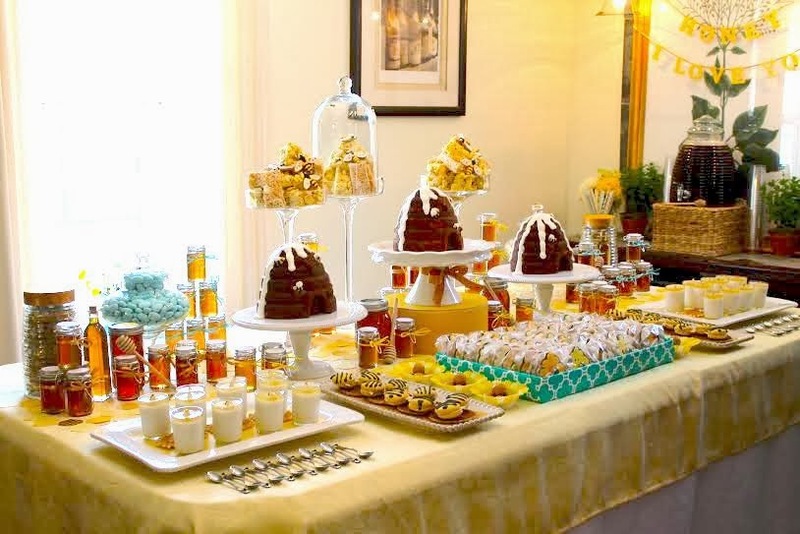 Part of the dessert table included honey candies in bee wrappers set atop a honeycomb paper-lined tray. Delicious panna cota-filled glasses mimicking beeswax candles were placed on a porcelain tray, which included Jules Destrooper butter crisp cookies. The recipe for the panna cotas with honey gelee came from Amy Atlas' book, Sweet Designs. In fact, Jessica took a lot of inspiration for this celebration from her beautiful book. For each guest, Jessica baked and iced Bee & Hive cookies and tucked a pair into clear cellophane bags. Aren't they adorable? 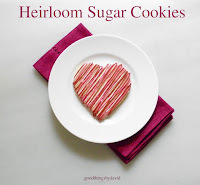 The reason I heard from Jessica in the first place was because she had such success using my Heirloom Sugar Cookie Recipe to create her cookies. Sweet! A small glimpse of the dessert table shows you how everything was displayed at several levels. For party favors, Jessica put up her favorite sourwood honey in old-fashioned clasp-lid jars and tied each with a colorful ribbon. I'm told that her great grandfather Marvin, loved this honey variety best. Take a closer look. Do you see those French macaroon cookies in the foreground? Each yellow macaroon was given a pair of sliced almonds for wings and the tops were striped with black royal icing to mimic a plump bee. I love these! Three cakes were made using two-part beehive cake molds and each was placed on a beautiful cake stand. The cakes were sandwiched with tasty buttercream frosting and were given a honey glaze. The tops were then drizzled with white royal icing and molded sugar bees were placed here and there along the sides. 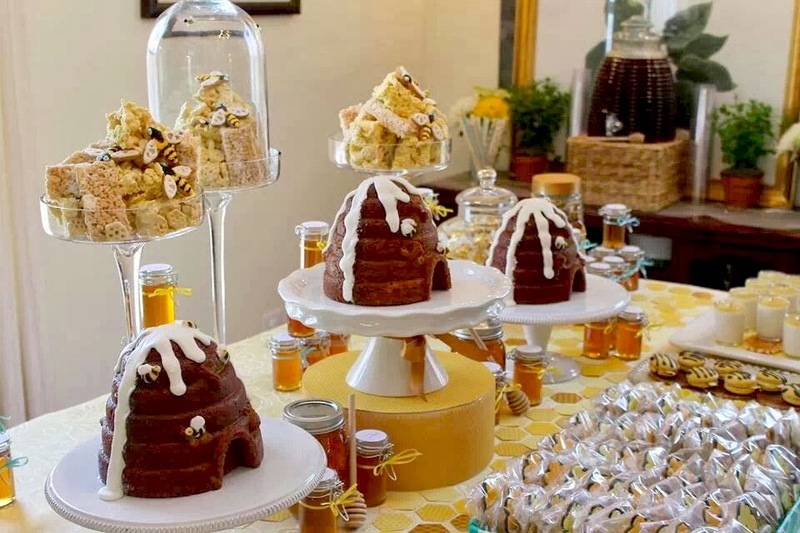 You can see the three beehive cakes standing proudly down the length of the dessert table. Last, but not least, were the glass cloches which had rice krispie & honeycomb cereal treats, with a few buzzing bee cookies. They looked like honeycombs in jarred honey found at the farmers market. On the side table there was a large beehive drink dispenser filled with honey-sweetened iced tea. All of this for the birthday boy! Here is Sammy getting ready to enjoy his first slice of cake on the high chair. 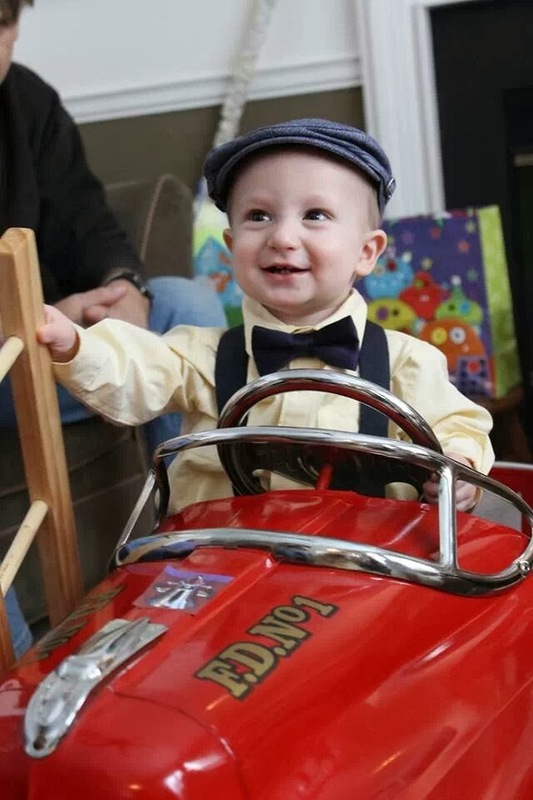 Friends and family gathered from near and far to wish this little guy the happiest of birthdays, and you can bet that everyone had a great time. Says Jessica, "Our family and friends gathered here at our home in Maryland from across several states and generations to celebrate. One family friend found a rusty and forgotten pedal car in his attic this winter and worked to scrape the rust off of the chrome wheel, made new ladders and waxed the paint to a candy apple shine. It was the highlight of the day for Sammy when they rolled it out of a big cardboard box and placed him inside. It was a lovely day for a party and a fine time to gather and share stories and laughs. We are fortunate to celebrate the life of the newest member of our family in a way that honors and appreciates the generations who came before him." This photograph captured the true spirit of the day: a collaborative effort to create and share a most joyous celebration of baby's first birthday with family and friends. Thank You, Jessica for sharing your family's precious moment with us! Bee's Knees indeed, David! Thank you for sharing thise beautiful celebration with your readers. I LOVE everything, but I especially love the cookies created with your wonderful recipe and the Beehive cakes. I know that you and I both own (and cherish) the Beehive cake mold from Martha by Mail. I confess I've never used it but after seeing this post, it's back on my list to try! Happy Birthday to dear Sammy and happy weekend to you, my friend! Best to you, Janet! I knew the moment I laid eyes on these beautiful photographs that I had to share them here! One of my favorite posts! I love the entire party! It's such an inspiring birthday party, Kenn. I hope many readers glean an idea or two from it. I hear the only pay that rivaled this was Jessica's amazing wedding! I can only imagine, Peter! What a lovely post and Jessica was so gracious enough to share this special event. 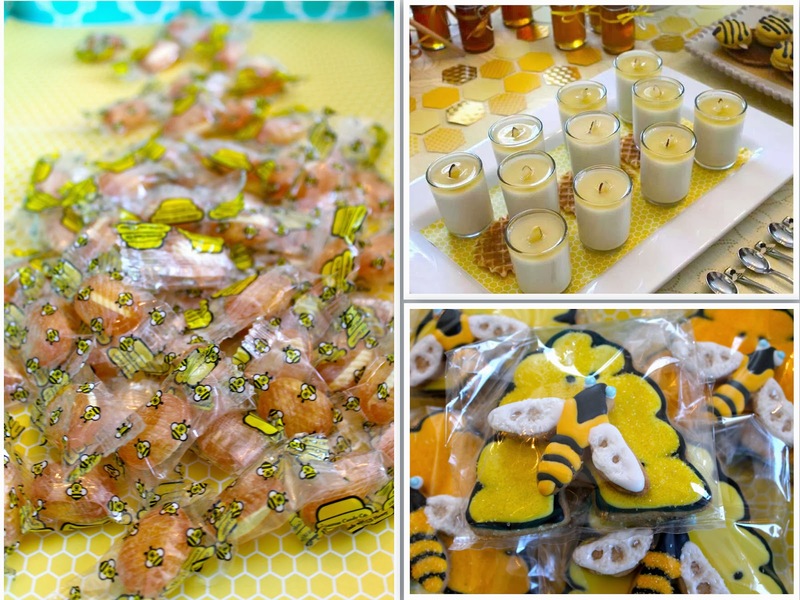 I love the Bee theme...the cookies are so cute and the candied honey is a great idea. The sweet smile is the icing on the cake. What a sweet idea for a baby's first birthday! And he sure seemed to appreciate the efforts :) Very inspiring! Just in time for me to steal some ideas for my youngest's birthday next month, though I've been ordered to make it a bunny themed one. 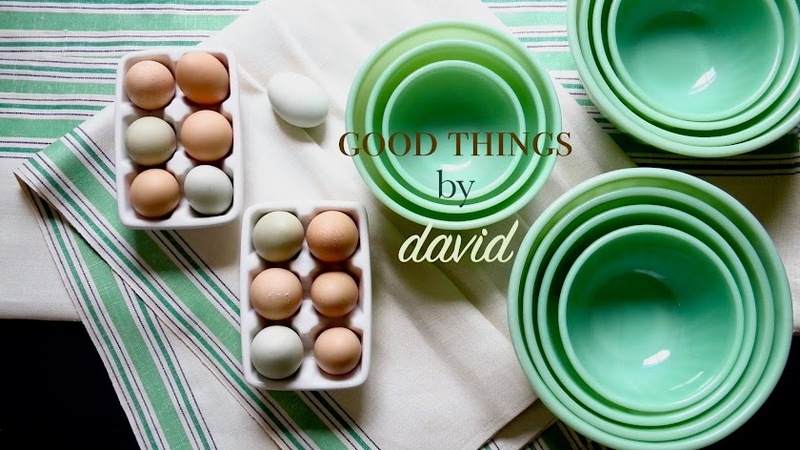 Thanks for telling me about ebay, David - I've got some really great finds now :) Milk glass nesting bowls, hand blown milk glass eggs for easter decor, copper cookie cutters and more. We have something similar to ebay in Norway as well, but the American version is way more fun! You should take some ideas from this birthday party for your child's celebration this spring. It's so adorable! Even if you're doing a bunny-themed birthday, you can still apply the tips and decor to it. By the way Anette, I do have a couple of milk glass pieces on my ETSY shop right now. Click on that button in the side bar of the blog and look at them. Oh my goodness, Anette! I so wish you lived close by! I have hundreds of pieces of milk glass I would gladly loan you for the party! I obtained a good portion of them on eBay too... it is such an awesome resource! I don't know if it is the look you're going for, but if you have a Pinterest account, do a quick search for "bunny jars" and check out the pictures if you haven't seen them already. They are adorable and would make amazing favors! Grab some small plastic bunny figurines from the craft store, glue them to the tops of baby food jars and spray paint them in pastels. Stick a little easter grass and some foil eggs in there (or anything else you like) and it looks like a million bucks! Have fun planning your little one's special day!! David, thank you for featuring the party and thank you to everyone for all of your kind words. Those milk glass pieces in your Etsy shop are really great pieces! Beautiful as well as useful. I would have bought them if you shipped outside of the US. Hope you are enjoing springflowers and sunny, warmer weather like I am right now :) I've spent a lot of time gardening the past few days. Jessica, you have such wonderful ideas!!! I love that you suggested for Anette, doing the bunnies on jars for her party and then painting them in pastels. Too cute!! Anette, I would ship to you if I knew they would get there in 1 piece! As for the weather, we do seem to be thawing now so it's only a matter of time before I see my snowdrops and daffodils. I think this is so great! The way everything was set out at different levels makes it look more enticing. I want to decorate some cookies just like the ones here! Jessica clearly has a good sense of style. Lucky Sammy! Happy Birthday to him! Your milk glass collection sounds great - lucky you :) I just started, so I only have a few things. 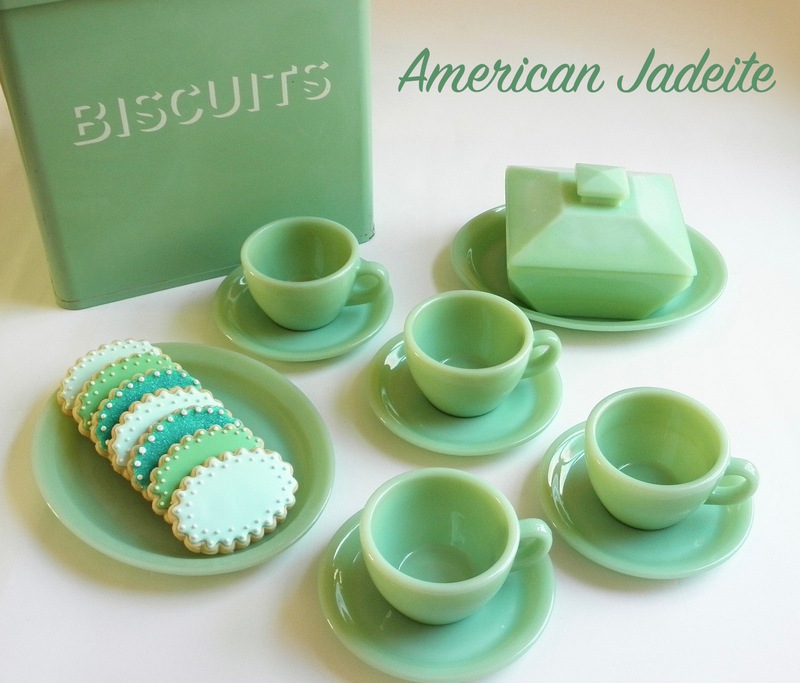 But I'll mix in some white porcelain, and it'll be fine. At least I have some milk glass bunny candy dishes - they'll be perfect for the party. Such a beautiful display for that adorable little boy's birthday! And, wouldn't those cakes be a lovely thing to have for an Easter dinner, or just because it's finally spring?! I've gone over those pictures so many times because every time I do, I see something new! Thanks for sharing this with all of us, David. So much inspiration, I cannot wait to have the time in my kitchen! All of it is perfect for a spring dinner or lunch. Thank You all for the great responses!